Khanty Mansiysk: Five-time World Chess Champion Viswanathan Anand inched closer to clinching the Candidates Chess tournament title after settling for an easy draw as black against Vladimir Kramnik of Russia in the 11th round here. With just three rounds to go, Anand maintained his full point lead over nearest rival Levon Aronian of Armenia and with two white games in hand out of the last three, there is little that can go wrong for the Indian ace. On what turned out to be a pretty dull day, Russian Peter Svidler played out a draw with Aronian, Dmitry Andreikin signed peace with Shakhriyar Mamedyarov of Azerbaijan while Sergey Karjakin held his position against Veselin Topalov of Bulgaria to get a half point. With all games ending in draws, the leader-board did not see any change apart from the fact that everyone added to their overnight tally in this 600000 Euros prize money tournament that double up as the selection event for the next World Championship challenger. 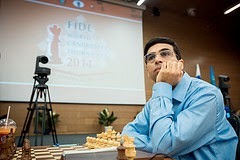 Anand took his tally to seven points out of a possible 11 and Aronian remained his closest adversary with six points. Karjakin, Mamedyarov and Svidler follow the Armenian a half point behind while Kramnik and Andreikin have five points in all. Topalov is on last spot with 4.5 points in his kitty. Kramnik chose the Catalan opening with white pieces and the pressure of having lost the last two games weighed heavy on the Russian. Anand opted for a quite and fashionable system wherein Kramnik's attempt to complicate matters did not see the light of the day. In the early middle game, Anand had a pawn weakness and instead of a passive defense, he sacrificed it for active counter play. Kramnik played on with an extra pawn but had to give it back to release the tension. Soon peace was signed in just 31 moves. Peter Svidler's approach was cautious against Aronian after the latter parted with his Bishop for a Knight early in a Reti Opening. Playing white, Svidler allowed a symmetrical pawn structure on the board the rooks changed hands on the only open file leading to a level queen and minor pieces endgame. 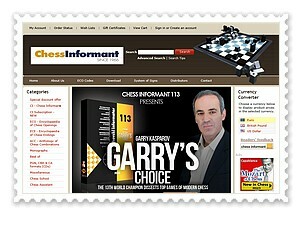 The players did not find a reason to continue after the queens also got traded and the draw was agreed to in 33 moves. Sergey Karjakin had some chances after defending a slightly passive position for a long time. His opponent Veselin Topalov went for the English opening and faced the Hedgehog set up. Though Topalov had optically better prospects for the major part of the game, Karjakin also hung in there waiting patiently and making the right defensive moves. After exchanging queens, Karjakin still had an unpleasant position but easier to defend. In his bid for complications, Topalov sacrificed a couple of pawns and Karjakin followed up with a counter rook sacrifice for a Bishop. While Karjakin came out with a miniscule advantage after the tactical sortie, Topalov was equal to the task in defense when situation demanded. The game lasted 57 moves. Candidates Chess R10: Anand on Course to WC, Keeps 1 Point Lead! Khanty Mansiysk: Former World Chess Champion Viswanathan Anand remained on course for a rematch with Magnus Carlsen of Norway after securing an easy draw against Shakhriyar Mamedyarov of Azerbaijan in the 10th round of the Candidates Chess tournament. It turned out to be another good day for Anand as main contemporaries Levon Aronian of Armenia and Vladimir Kramnik of Russia failed to bridge the gap and the Indian ace continues to be in front with a full point lead. Aronian could not use his white pieces to much use against Bulgarian Veselin Topalov and had to settle for a draw while Kramnik's poor run continued when he failed to spot a tactical stroke that led to a quick loss against compatriot Peter Svidler. The other game of the day between Russians Dmitry Andreikin and Sergey Karjakin also ended in a draw. With just four rounds to come, Anand is sitting pretty training his sights for the next world championship match on 6.5 points. Aronian remains the nearest contender on 5.5 points followed by Mamedyarov, Karjakin and Svidler who all have five points apiece. Kramnik remained on 4.5 points and he has Andreikin as company while Topalov is at the last spot another half point adrift. Apart from the match for the next world championship, the winner here also takes home 135000 euros. Playing with white, Anand stuck to his guns and repeated the moves of his previous round game against Topalov. The opening went off well for Anand but Mamedyarov was probably not impressed and came up with the equaliser in no time. The Indian had to exchange the dark square Bishop early and then Mamedyarov followed suit with castling on the queen side leaving the position absolutely level. Anand tried manoeuvring his pieces to correct squares and once that was done the players just decided to split the points. The game lasted 30 moves. The shocker of the day came from Svidler when Kramnik simply missed a game changing tactical stroke. It was the Dutch defense as black by Svidler and Kramnik, trying to shy away from the usual, allowed his Russian teammate to equalise easily. It was in the middle game that Kramnik missed a simple check by the Bishop. The result was huge deficit in the material as Svidler picked up a rook and a couple of pawns for his Bishop and romped home. Aronian faced the Slav defense from Topalov and the latter had no difficulty in getting a playable position. The pieces got exchanged at regular intervals and even though Aronian had something to hope for, the position was close to equal for major part of the game. The ensuing rook and minor piece endgame had little chance for either player and the peace was signed in 45 moves. Karjakin-Andreikin duel was the shortest game of the day lasting 29 moves. 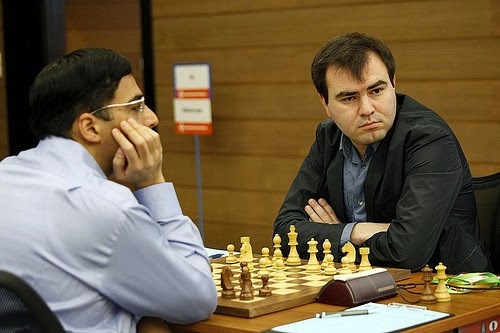 Results after round 10: Vishwanathan Anand (IND, 6.5) drew with Shakhriyar Mamedyarov (AZE, 5); Vladimir Kramnik (RUS, 4.5) lost to Peter Svidler (RUS, 5); Levon Aronian (ARM, 5.5) drew with Veselin Topalov (BUL, 4); Sergey Karjakin (RUS, 5) drew with Dmitry Andreikin (RUS, 4.5). Candidates Chess R9: Anand on Top! khanty Mansiysk world chess candidates 2014 Round 9 -- India’s Viswanathan Anand regained the sole lead with a sparkling victory over former challenger Veselin Topalov from Bulgaria in the ninth round of Candidates Chess tournament, here today. The hard-earned victory proved crucial for five-time World Champion Anand as he took his tally to a six points out of a possible nine. The equations went for a toss in the ninth round as Shakhriayar Mamedyarov defeated top seed Levon Aronian of Armenia and Vladimir Kramnik suffered a shock defeat at the hands of Russian teammate Sergey Karjakin. 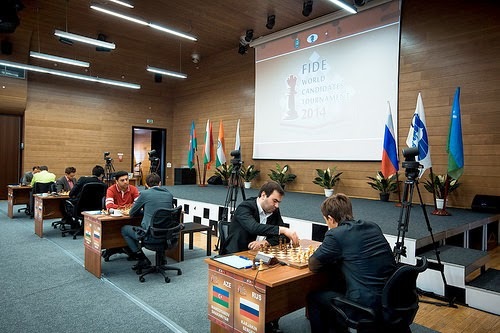 The other game between Russian duo of Dmitry Andreikin and Peter Svidler ended in a draw. With five rounds still to come, Anand now enjoys a full point lead over Aronian who remained on five points after the debacle. Kramnik was joined by Karjakin and Mamedyarov on 4.5 points for joint third spot while Andreikin and Svidler are now joint sixth on four points apiece while Topalov is on the last spot on 3.5 points. To sum things up, Anand is on a roll and will fancy his chances a great deal now. It was Anand’s day all the way. Up against Topalov’s pet Sicilian Najdorf, Anand did not give much away in the opening as white and retained a minuscule advantage as the game entered unchartered territories. Topalov decided to go for exchanges at regular intervals while his position remained slightly worse and this was not a good strategy as Anand continued to exert pressure when the game reached queen and minor piece endgame. The Indian picked up a pawn when Topalov erred and handled the remaining technicalities of the queen and pawns endgame in masterly fashion to script his third victory in the tournament. Mamedyarov played the spoiler for Aronian and continued with his roller-coaster ride in the tournament. After blundering his way against Kramnik in the seventh round game when he mishandled a won position and lost, Mamedyarov made sure he held on to his own after attaining an advantage against Aronian who was out of sorts in this ninth round game. Mamedyarov won in 44 moves. Karjakin continued with his comeback act and defeated Kramnik for his second straight victory. Starting with an ultra-safe approach in the opening, Karjakin capitalised on some erroneous play by Kramnik in the middle game to win a handful of pawns. Results round 9: V Anand (Ind, 6) beat Veselin Topalov (Bul, 3.5); Sergey Karjakin (Rus, 4.5) beat Vladimir Kramnik (Rus, 4.5); Shakhriyar Mamedyarov (Aze, 4.5) beat Levon Aronian (Arm, 5); Dmitry Andreikin (Rus, 4) drew with Peter Svidler (Rus, 4). 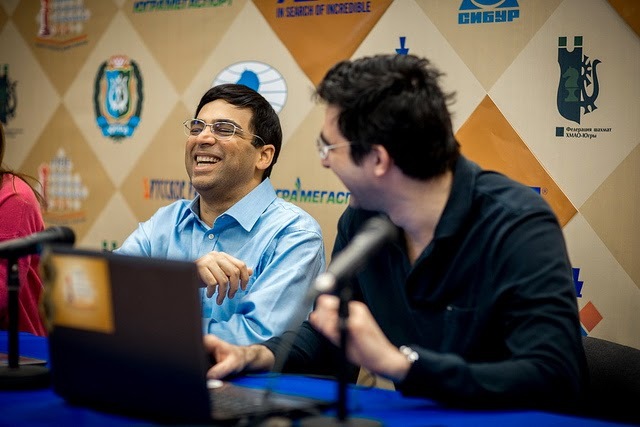 Khanty Mansiysk : Five-time world chess champion Viswanathan Anand on Saturday, gave jitters to his fans before signing an early draw with top seed Levon Aronian of Armenia in the eighth round of Candidates chess tournament here. The draw against Aronian was important for Anand as the Indian ace not only maintained his joint lead with the Armenian but now also has four white games to come in the last six rounds that gives him an edge over others. Vladimir Kramnik of Russia could not get past the solid defences of a resurgent compatriot Dmitry Andreikin and had to settle for a draw and the game between Veselin Topalov of Bulgaria and Shakhriyar Mamedyarov of Azerbaijan was also drawn after showing promise of an intense battle. In the other game of the day, Peter Svidler was fighting hard to salvage a half point against Russian team-mate Sergey Karjakin. With six rounds still to go, Anand and Aronian have five points apiece and they are followed by Kramnik on 4.5 points. Svidler on 3.5 has an extra ongoing game in hand compared to Topalov, Andreikin and Mamedyarov, who all inched themselves up to the same score. 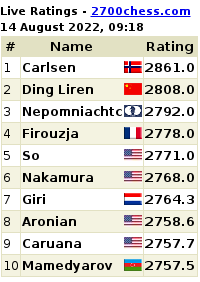 Karjakin on 2.5 is on the last spot. The stakes are high in the candidates as the winner takes home 135000 Euros as prize money apart from the right to challenge Magnus Carlsen in the world championship match later this year. It was a very unusual start to the game between Anand and Aronian. Playing white, Aronian came up with a less played manoeuvre on the third move by moving his queen while Anand threw caution to the winds with his next move that could not be found in any existing chess database. If this was not enough, Anand sacrificed a pawn on his fourth move for sheer compensation and many in fact believed that the Indian had blundered. However, as Anand pointed out in the post-game conference, he had seen the pawn sacrifice and thought it gave sufficient compensation. Aronian, though a pawn up, did not like his position. "I think I was worse," he conceded later. As it happened after some routine manoeuvres, the players decided to repeat and the game was drawn in just 19 moves. Kramnik showed aggression out of an irregular opening once again but Andreikin was up to the task in his defense. With some cold-water treatment, Andreikin even stood slightly better for a while when he captured a pawn and Kramnik had to liquidate to a level endgame at the first opportunity. 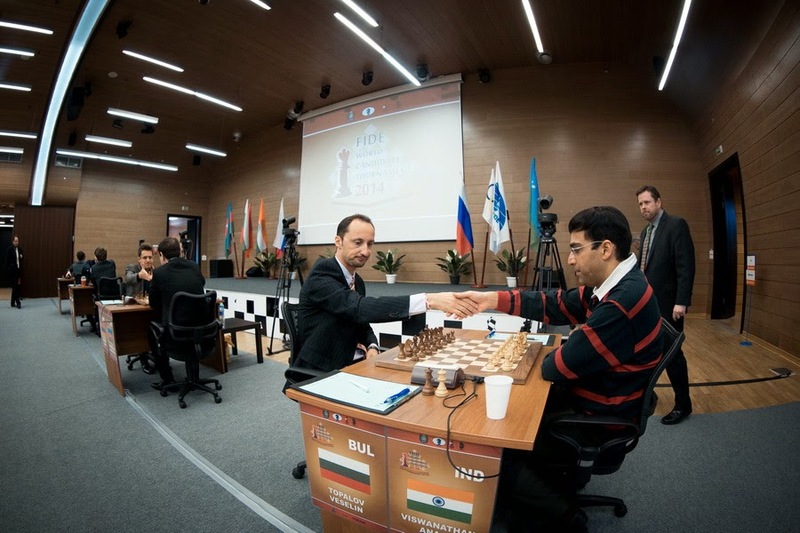 Results round 8: Levon Aronian (Arm, 5) drew with V Anand (Ind, 5); Vladimir Kramnik (Rus, 4.5) drew with Dmitry Andreikin (Rus, 3.5); Veselin Topalov (Bul, 3.5) drew with Shakhriyar Mamedyarov (Aze, 3.5); Peter Svidler (Rus, 3.5) playing Sergey Karjakin (Rus, 2.5). Khanty Mansiysk, Russia: Five-time world chess champion Viswanathan Anand the signed peace with Peter Svidler of Russia in the seventh round to play out his fourth consecutive draw at the Candidates Chess tournament. But, Aronian played a fantastic game to beat Sergey Karjakin and drew level with Viswanathan Anand. Levon Aronian looks on as Shakhriyar Mamedyarov sips some coffee on his way to losing to Vladimir Kramnik. Photo: official website. In other games, Veselin Topalov of Bulgaria was outdone by Dmitry Andreikin in the big upset of the day while Russian Vladimir Kramnik played a wild, wild game to beat Shakhriyar Mamedyarov. At the halfway stage, Anand took his tally to 4.5 points out of a possible seven and will have an easier second half wherein he has four white games lined up out of seven. Levon Aronian too now has 4.5 points. 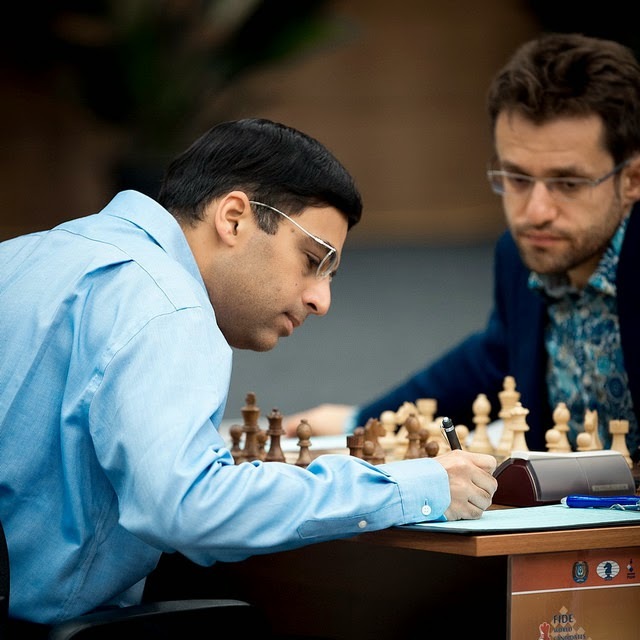 Watch Live Today the big match Levon Aronian vs Viswanathan Anand in Round 8 at the Khanty Mansiysk World Chess Candidates 2014. Svidler was a bit tentative in the closed Ruy Lopez after Anand went for the Berlin defense - the flavour of the season. The Indian got in to the groove pretty fast with his knights moving to the King side for some rapid action in the early stages of the middle game. Svidler felt the heat but did not give much away. The critical moment was when Anand could win a pawn which was also suggested by all chess engines albeit hard to judge for a human mind. 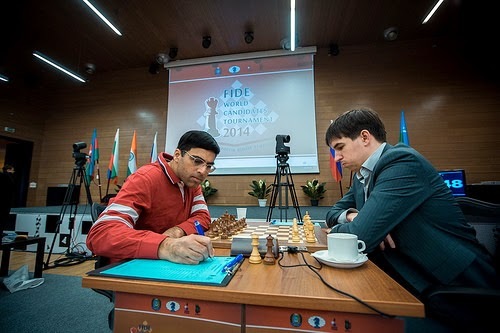 Anand in the end concluded that it was all a bit "messy", a sentiment echoed by Svidler. However, the game was far from over as Anand came up with a positional queen sacrifice to liven things up. Svidler knew his chances of holding were high with pawns exchanges and the Russian wasted no time in pushing his brigade forward. Anand could do little after a timely exchange sacrifice that left him with two rooks for a queen. "In fact his draw offer was useful, it helped me with my evaluation. Peter (Svidler) is not a devious guy, there are people who will offer a draw in a worse position," Anand said in the post-game conference. The Indian ace conceded that he was not at his best on Friday. "I needed a lot of time and calm moves before I can threaten 'f3', I can't do it," he said. Andreikin caused a sensation at the expense of Topalov who was a pale shadow of himself. It's been a roller-coaster ride for Topalov in the last three rounds as he lost one against Svidler, bounced back to beat Kramnik and now suffered a disastrous loss against Andreikin. Topalov went for the Queen's gambit declined as black and faced a side variation. The Bulgarian got a decent opening with a temporary pawn sacrifice but missed the thread as he gave too much weightage to an optical attack against the king. Khanty Mansiysk: Placed comfortably on top of the table with a half point lead, five-time world chess champion Viswanathan Anand will enter the crucial phase of the Candidates chess tournament, taking on Peter Svidler after the second rest day in Khanty Mansiysk on Friday. From a great beginning to some cautious play, Anand, with four points in his bag from six games, enjoys a half point lead over nearest contender Levon Aronian of Armenia. It's a closely matched field as almost everyone except the lowest seed Dmitry Andreikin of Russia seems to be in the race for the challenger of the next world championship match against Magnus Carlsen to be played later in 2014. The eight-player double round-robin tournament has seen a lot of excitement and there are no clear favourites as yet but surely Anand has an edge thanks to his half point cushion. The stakes are high as apart from a match against Carlsen, the winner will take home 1,35,000 Euros (a little over Rs one crore) as cash prize. The Russian duo of Vladimir Kramnik and Peter Svidler, Bulgarian Veselin Topalov and Shakhriyar Mamedyarov of Azerbaijan follow Aronian a half point behind on three points apiece and they all have reasons to fancy their chances as the tournament nears the completion of the first half. Not far behind is Sergey Karjakin on 2.5 points who can not only play the spoiler but also has it in him to pull a few victories to match leaders. Anand has been in lead from day one. It was the day when Anand showed to the world that he is not finished yet. No one could have asked for a better start than a victory over Aronian. Next followed a draw with Topalov with the Indian ace in absolute control and in the third round was an inspiring performance when Mamedyarov was crushed in all departments of the game. However, since then it has been a cautious approach by Anand. In the fourth round Kramnik played the Vienna variation wherein the Indian would fancy his chances on another day. The Russian showed better preparation and got an easy draw. Andreikin struggled a little in the fifth round but did not face many difficulties before drawing with the Indian and then in the previous round, Sergey Karjakin again suffered just momentarily before steering himself to safety. If the first three games showed Anand in great spirits, the last three have dampened them a little. And the next two games will be most crucial as Anand first meets Svidler with black and then has another black game lined up against Aronian in the eighth round. Should he come out unscathed in the next two, Anand will become a huge favourite for title in Khanty Mansiysk. After an insipid start that involved four draws and a loss, Topalov came back with a bang scoring over Kramnik in the previous round. The result changed many equations and Kramnik who had looked almost invincible thus far suddenly turns vulnerable. It was a similar story for Svidler who had come up with some sterling chess till the fifth round. Had Svidler been on track in each round, he would have had at least one point more till the fifth round itself. And the way he lost the sixth round game against Mamedyarov goes to prove that nerves play a major role in big games. Kramnik crushed Karjakin in round two, missed a winning continuation against Aronian and got the easiest of draws as black against Anand. Things were shaping out well till he met Topalov. The Russian will have to do the hard work over again. Khanty Mansiysk, Russia: Viswanathan Anand remained in sole lead with a third straight draw, signing peace with Russian Sergey Karjakin in the sixth round of Candidates Chess tournament here on Wednesday. After scoring two victories in the first three rounds itself, Anand did not get many chances for the third day running even as Karjakin had to work hard for the half point. It turned out to be another high-tension round in the candidates that will select the challenger to Magnus Carlsen of Norway in the next World championship match later this year. Bulgarian Veselin Topalov reacted like a wounded tiger after losing the previous round to Peter Svidler and defeated second seed Vladimir Kramnik of Russia in a fine display while Shakhriyar Mamedyarov of Azerbaijan put it across Peter Svidler of Russia to announce his arrival as a contender in the tournament. Anand remained in sole lead with a third straight draw, signing peace with Russian Sergey Karjakin in the sixth round of Candidates Chess tournament. If this was not enough, top seed Levon Aronian of Armenia spoiled all the hard work of the first few hours and mishandled a winning position to let Russian Dmitry Andreikin off the hook with a draw. After the lopsided round, Anand took his tally to four points and remained a half point ahead of Aronian. While Kramnik and Svidler slipped to joint third spot along with Topalov and Mamedyarov who came back to a fifty percent score. Karjakin moved to 2.5 points and is now on seventh spot, a half point clear of Andreikin who was simply lucky to survive today. For the first time in Candidates, the main line of the Berlin defense came on board. Anand has not been able to crack it since the last world championship match and today was no different even though Karjakin had to find some right way to equalise. Results Round 6: V Anand (Ind, 4) drew with Sergey Karjakin (Rus, 2.5); Veselin Topalov (Bul, 3) beat Vladimir Kramnik (Rus, 3); Shakhriyar Mamedyarov (Aze, 3) beat Peter Svidler (Rus, 3); Levon Aronian (Arm, 3.5) drew with Dmitry Andreikin (Rus, 2). Candidates Chess R5: Anand Draws Andreikin, Keeps Lead with 3.5! Khanty Mansiysk (Russia): Former World Chess Champion Viswanathan Anand played out an easy draw as black against lowest-seeded Dmitry Andreikin of Russia in the fifth round, but kept the lead at the Candidates chess tournament here. It turned out to be a no-hassle day for Anand as the Indian was seen pressing for an advantage towards the end of the game. The draw took Anand to 3.5 points out of a possible five and he keeps his half point lead with the end of the first half now approaching near. Anand chose the Berlin defense, an opening he has not been able to break himself as white for some time and Andreikin employed the closed set up that was on expected lines. The Russian got a slightly favourable position in the middle game but was made to sweat hard for more by Anand who played at a good speed. 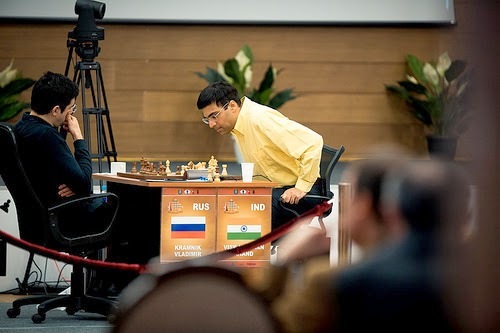 It was a mild time pressure for Andreikin that led him into difficulties and Anand was fighting for an advantage towards the end of the first time control. 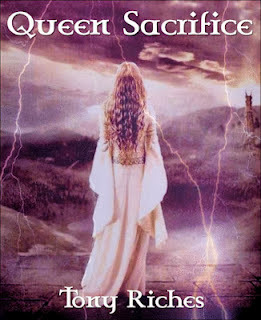 The Russian, however, got his act together just in time to find the path to equality after trading the queens. The peace was signed in 42 moved. "I was trying but I didn`t see anything concrete, my hope was when his king came out but after the queen exchange its just a draw," said Anand in the post-game conference, adding, "I was very happy with my position in the middle game but it did not become more". In other games of the day Peter Svidler of Russia defeated Veselin Topalov of Bulgaria while Sergey Karjakin of Russia played out a draw with Azeri Shakhriyar Mamedyarov. Russian Vladimir Kramnik was close to winning against Levon Aronian of Armenia, but after a long struggle the latter was able to hold his fort together. With Anand in front on 3.5 points, Svidler, Kramnik and Aronian follow him a half point behind. Topalov, Karjakin and Mamedyarov are on two points each from their five games while Andreikin remains at the bottom on one and a half points. Svidler came out with a sterling performance to beat Topalov. From a Ruy Lopez Moller, Svidler opted for the variation he had popularised some years back and did not get any advantage. Topalov`s opening preparation may have worked in his favour, but the Bulgarian did not handle the intricacies as well as he wanted. Svidler got a small advantage first and then his wily manoeuvres ensured that white`s advantage grew in the rook and opposite colour Bishops endgame. As the position became more difficult, Topalov lost track and blundered in to a hopeless position. 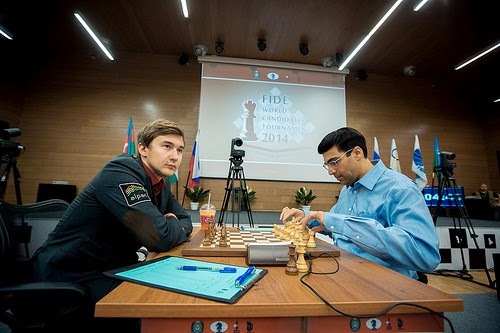 Sergey Karjakin and Shakhriyar Mamedyarov played out a regulation draw. Karjakin did not get anything with his white pieces against the Sicilian defense and the pieces kept getting exchanged at regular intervals. In almost no time, the players reached a heavy pieces endgame where the final result was only a matter of time. Vladimir Kramnik of Russia was involved in a heated battle against Levon Aronian. The Russian did everything right to attain a dangerous attack with his white pieces but could not force matters as Aronian came up with a stupendous Queen sacrifice. The position remained better for Kramnik but the Aronian just found the right defense to equality. The longest game of the day lasted 60 moves. Five-time World Chess Champion Viswanathan Anand played out a draw with Vladimir Kramnik in the fourth round but remained in sole lead to stay in contention in the Candidates chess tournament in Khanty Mansiysk. Kramnik’s Vienna variation has been analysed extensively and Anand went for a variation which is conclusively drawn. The draw took Anand to three points out of a possible four and the Indian remained in sole lead. Kramnik remained in second place on 2.5 and was joined by top seed Levon Aronian of Armenia on 2.5 points. Aronian scored a remarkable victory over Russian Peter Svidler. Former World Chess Champion Veselin Topalov of Bulgaria signed peace with Sergey Karjakin of Russia while Shakhriyar Mamedyarov of Azerbaijain scored his first victory at the expense of Dmitry Andreikin of Russia. With 10 rounds still to come, it's an early call yet. Anand, Kramnik and Aronian might be fighting at the top for a berth as the finalist for the next world chess championship, but the likes of Svidler, Karjakin and Topalov are fighting it through. Topalov had no difficulties in keeping the momentum against Karjakin in an English opening game while Mamedyarov was at his best for once in crushing Andreikin with white pieces. 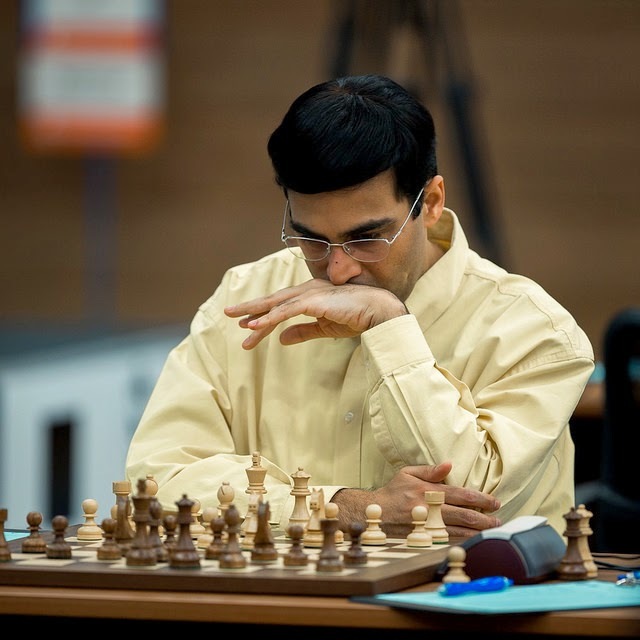 Khanti Mansiysk, Russia: Five-time World Chess Champion Viswanthan Anand continued his fine form and crashed through the defences of Shakhriyar Mamedyarov of Azerbaijan to notch up his second successive win in the Candidates Chess tournament. Not many experts had given Anand a chance coming in to candidates after he lost the World Chess Championship match against Magnus Carlsen of Norway in November last year. However, the 'Tiger from Madras' has not only proved his critics wrong but has also emerged as a serious contender even though it is still early days in the 14-round tournament. With 2.5 points in his kitty from the first three games, Anand is now in sole lead. The other games in the eight-player double round robin tournament ended in draws. Former World Chess Champion Veselin Topalov of Bulgaria missed out on his chances against top seed Levon Aronian of Armenia while Dmitry Andreikin signed peace with fellow Russian Sergey Karjakin after playing solidly as white. Peter Svidler had the upper hand in the game versus Vladimir Kramnik, but the latter managed to draw. The fact that Anand's victory came with black pieces was icing on the cake for the Indian. Playing the Modern variation in the Slav defense, Anand had little trouble equalising out of the opening and Mamedyarov was also looking at dynamic possibilities after losing the previous round. It was in the early middle game itself that Anand sensed his chances. Mamedyarov could not find any way to improve other than king side pawn advances and that met with a timely breakthrough by Anand leaving weaknesses on white's king side.